We made it to Lewistown, and I took a stroll down the main street with my oldest nephew. I felt like we had jumped into Mr. Peabody’s WABAC Machine. Kids were riding bicycles past storefronts filled with toys, appliances and furniture. 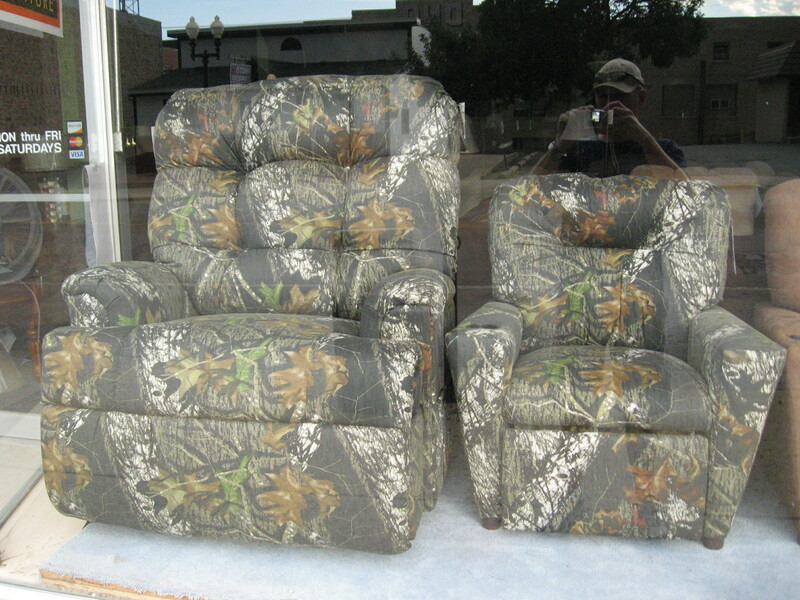 I know you can’t see the chairs because they are camouflaged. There was also a movie house that was 90 years old. I know that because we went into the lobby and asked. 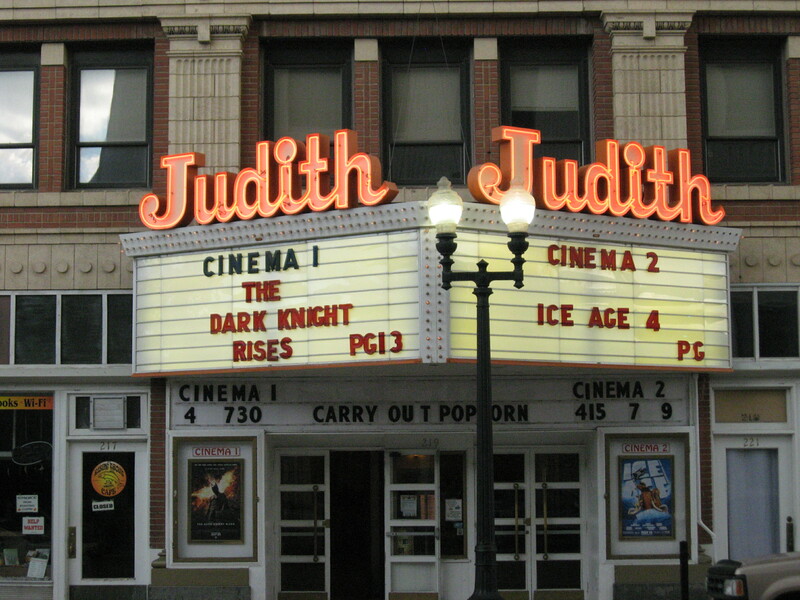 It was strange to see a modern superhero movie like The Dark Knight Rises playing in a theater such as this. I assume it wasn’t the silent version. As we walked, I began to notice that most of the downtown buildings were adorned with the dates which they were built. Almost all of them were built between 1900 and 1920, and no other commercial buildings, except for McDonald’s, had been built. This was a clue that the town hit its peak in the first decades of the 20th Century and has not grown since. 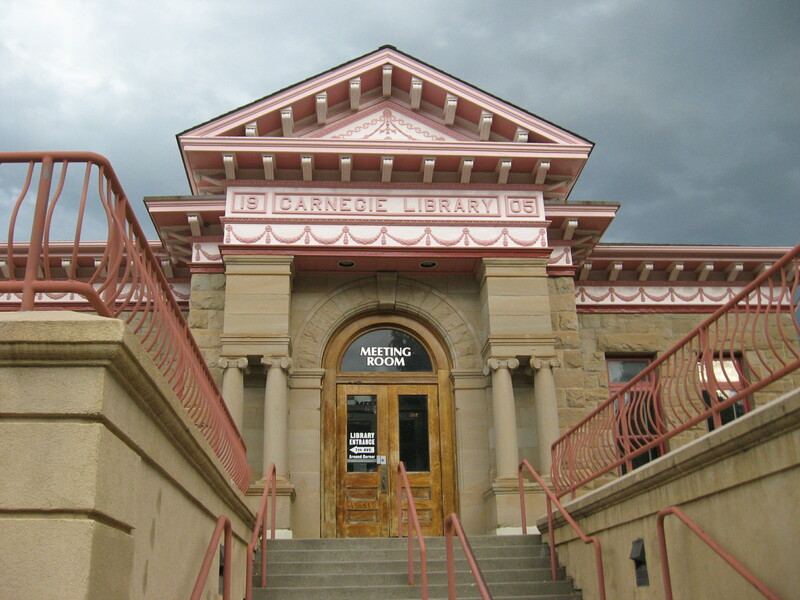 It must have been a thriving community because it was home to a Carnegie Library. Carnegie was one of the richest people who ever lived, but people still mispronounce his name. After spending an evening at the Yogo Inn, which sits on the geographic center of Montana, we visited friends who grow wheat and raise cattle near Winifred. The first ranch was only 20,000 acres. I say that because the second ranch was 35,000 acres. 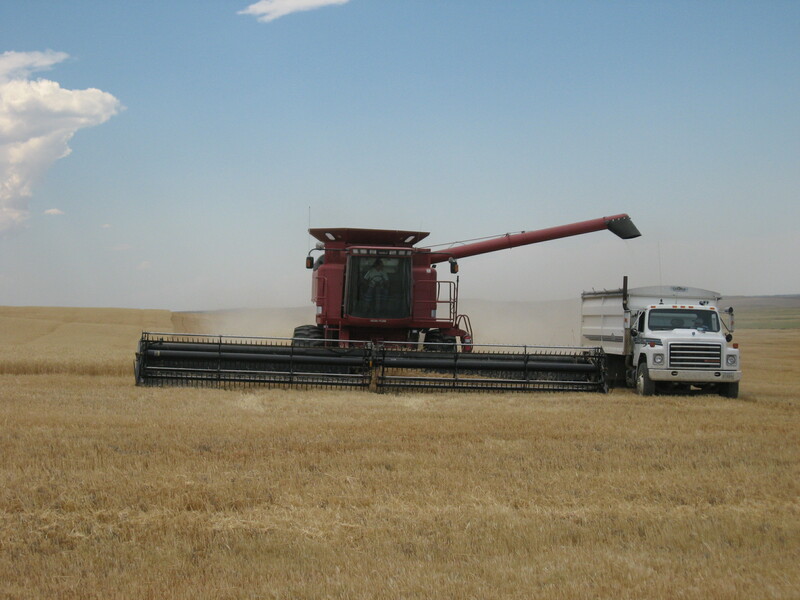 They were in the midst of harvesting their crop, so we drove into the wheat field to check it out. Now this is real farming. 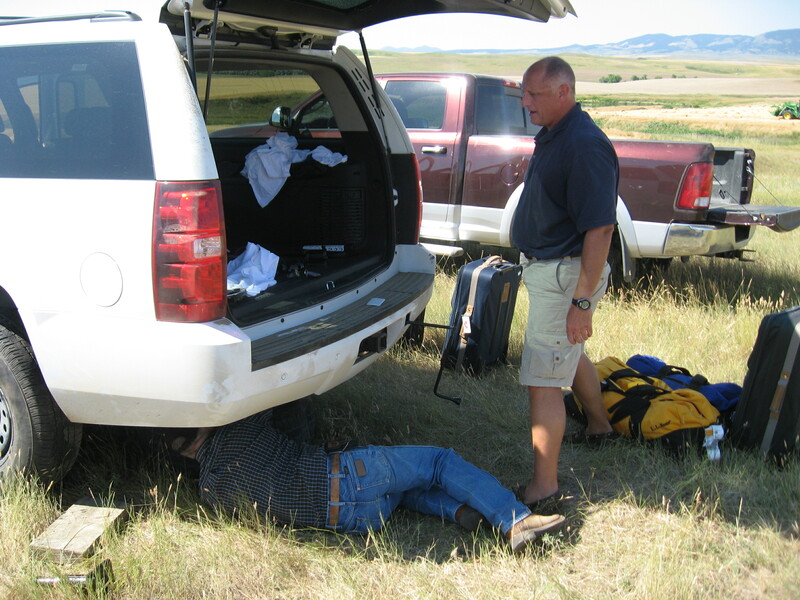 Unfortunately, our SUV did not make it through the field as well as the farming machinery. We got a flat tire. We escaped the wheat field and drove to the second ranch, where we were treated to a home-cooked meal. At least, most of us were treated. My youngest nephew wasn’t feeling well and didn’t want to eat. He went to the bathroom and threw up before experiencing a Dumb and Dumber moment. The toilet wouldn’t flush, and he went into panic mode. Finally, he was able to get the thing to work. My oldest nephew rode the harvester until we forced him to leave. This is not tiddly-winks farming. What did I learn on the stage of the trip? 1. Farming in central Montana is a tough and isolated way of life. 2. 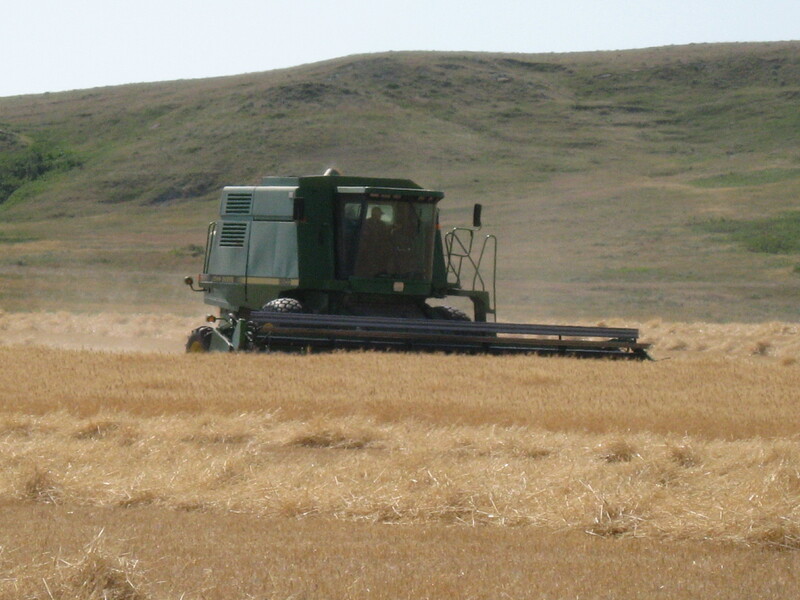 Don’t drive into a wheat field. 3. Be sure a toilet works before using it. What a beautiful little town, and one I must admit I hadn’t heard of (which sent me on a trip to Google Maps & Wikipedia for more info). I’ve traveled throughout the West of Montana, and across the whole of the state (via train & the 90), but haven’t spent much time in the center or east. I would much rather visit an out-of-the way place in most cases than a tourist destination. Regarding your three points–I’m pretty sure I already knew 1&2, but 3 is advice anyone can use. It is a neat town. Western Montana is the most beautiful part of the state in my opinion. However, the central part has its qualities as well. I haven’t spent much time in the eastern section, but I hear that it is desolate.